Twitter was on fire this week after Brenden M. Dilley saw something in 1/1024th millennial politician Elizabeth Warren’s kitchen in her bizarre identity crisis video. In that video, Warren pops open a brew and got real with the people of America, yes, even Darth Vader got a shoutout from Warren, but Dilley said the real story in the video was what rested atop Warren’s kitchen cabinets. Dilley claims Warren had a Mammie teapot, a once popular fixture in mid-twentieth century kitchens, now considered a racist memento of a past era. I wonder if 1/1024th native American Elizabeth Warren would like to explain the "Mammie" tea pot on the shelf behind her? We all knew you were a racist fraud but this is pretty unbelievable. Put down the fire water, Pocahontas. Whether or not it represents a racist idol has yet to be determined as Warren has yet to show the public what it actually is. New York Congresswoman Alexandria Ocasio-Cortez even offered her two-cents on the topic, but her opinion doesn’t matter any more than yours or anyone else’s. 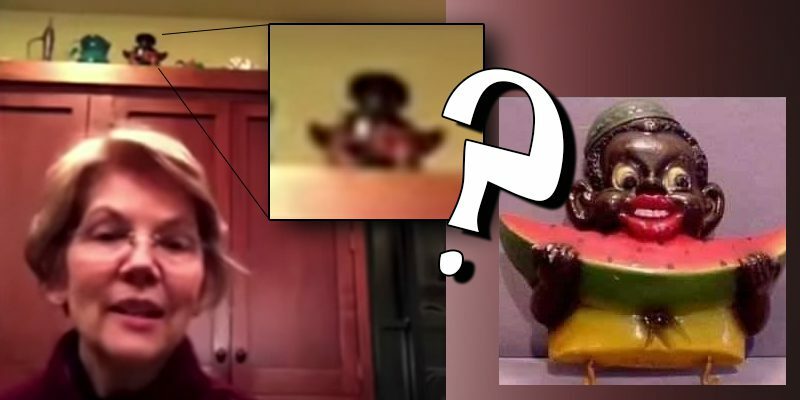 Although Dilley’s original guestimate on the object might have been off, one of his followers later offered a picture that better matched the teapot in the photo, but because of the clarity of Warren’s video, no definitive result has been determined yet. Dilley suggests Warren should show America what the object is in her next video. But, Dilley’s post isn’t just about a racist Ttchotchke in the kitchen of Elizabeth Warren. It demonstrates how American politics works now. Whether or not it’s a Mammie teapot or just some odd object she put on top of her dated kitchen cabinets doesn’t matter. It doesn’t matter any more than if Donald Trump colluded with Russia, or whether or not Brett Kavanaugh enjoys drinking beer when he sexually assaults women at parties he wasn’t at. It doesn’t matter whether or not the stock market rises when Donald Trump talks or fell whenever former President Obama spoke. Nothing matters in American politics anymore except for traction. It used to be the media that had the power of traction and distraction, but these days, that power is shifting into the hands of ordinary people on Twitter, Instagram, and other social media outlets. It’s how the Democrats achieved the successes they have had this past year and Dilley says it’s about time those on the right to learn the new rules of the game or face extinction. As to the issue of the object in question, it could be anything, but now Elizabeth Warren has learned a valuable lesson after popping her head in on social media…make sure that not only your closet is clean, but the top of your kitchen cabinets are clean too. Being popular on the internet isn’t as easy as popping open a brew and pretending you’re a millennial. It could just be a dark-colored vase with flowers. Go check out Brendan Dilley’s @TheRealHubLife if you want something to do to get you through the day and into the weekend on a high note. Related: STOP PHIL MURPHY FROM DESTROYING NEW JERSEY.